Products with the WOW factor! These include an aluminum spine fin coil (no dissimilar metals, no galvanic corrosion) with a plastic base. Water always accumulates in the base of a condensing unit. A plastic base will last longer. This model is exactly the same unit as a Trane, but all options are included. These have an all-plastic frame and case (which means no corrosion, even in the most humid areas such as a non-conditioned attic). In addition, they have an aluminum spine fin coil and a plastic blower wheel and housing. Because these parts are always the ones that corrode first, we can now avoid that problem. Have a look at this picture. This is the interior of a fibreglass ventilation conduit after a clean-up by others. 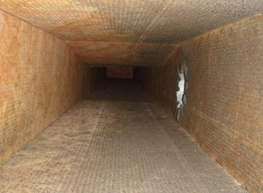 There is nothing special about this type of duct; it is installed in 99 percent of all residences in the Cayman Islands. However, as you can see, it is not really cleanable. The dirt is still there; fibres are still flowing through the air flow, and guess who is breathing it all in…you and your family. Our Koolduct system is a ventilation system made of a layer of compressed foam, which is non-flammable, covered with an aluminum sheet, inside and outside. It provides the best insulation, the best vapour barrier which prevents condensation, the best air quality (not made of fibers) and most importantly, it is fully cleanable. Have a look at the duct below and compare it with the one above.